Home to portraits, rare books and personal objects including Burns’ writing desk, the printing press on which Scott’s Waverley Novels were first produced, and the rocking horse he used as a child. We have Robert Louis Stevenson’s riding boots and the ring given to him by a Samoan chief, engraved with the name ‘Tusitala’, meaning ‘teller of tales’. There is also a plaster cast of Robert Burns' skull, one of only three ever made. This free museum is easy to locate just off the Lawnmarket, the top part of Edinburgh’s historic Royal Mile, in Lady Stair’s Close. With a wide range of stories and objects this museum has something for everyone to enjoy, whether young or old, local resident or visitor. You don’t need to have read these writers’ works to enjoy the fascinating life stories told in the Writers’ Museum. Please note that due to staff changes the Writers’ Museum collections enquiry service is temporarily suspended from 13 August 2018. We apologise for any inconvenience this may cause and look forward to resuming normal service as soon as possible. The Writers’ rich collections include books, manuscripts, portraits and fascinating personal items relating to Robert Burns, Sir Walter Scott and Robert Louis Stevenson. Highlights include a first edition of Scott’s novel Waverley and Stevenson’s beloved classic, A Child’s Garden of Verses. Manuscripts include Burns’ draft of Scots wha hae (‘Bruce’s Address to his troops at Bannockburn’). There is also the press on which Scott’s Waverley Novels were printed, a chair used by Burns to correct proofs at William Smellie’s printing office, and Stevenson’s wardrobe made by the infamous Deacon Brodie whose double life may have inspired the novel The strange Case of Dr Jekyll and Mr Hyde. The Writers' Museum is open seven days a week, 10am to 5pm. 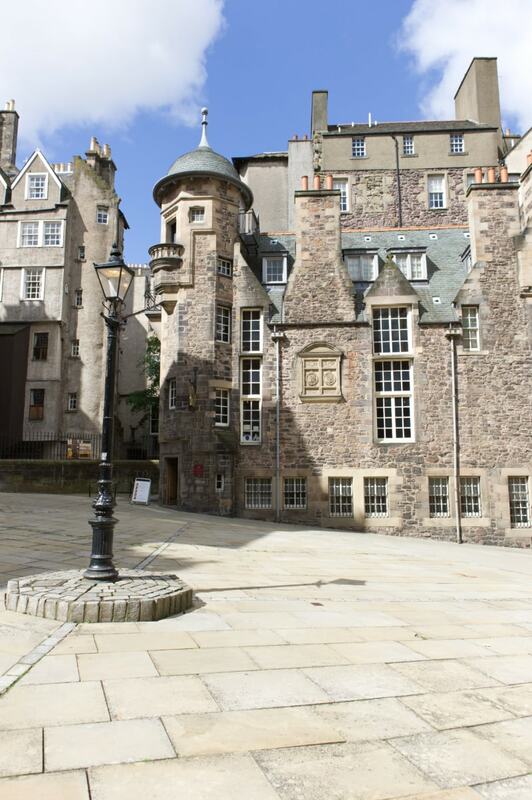 The Writers’ Museum is in Lady Stair's Close, just off the Lawnmarket section of the Royal Mile. Walk down from the Castle, pass Gladstone’s Land on your left, and you will see on your left the narrow close marked ‘Lady Stair's Close’ that takes you into Makars’ Court and the Museum. From Princes Street, cycle up The Mound to the Royal Mile. Turn right onto the Lawnmarket and look for Lady Stair’s Close on the right. From Waverley Station, cycle eastwards up Market Street to turn left onto The Mound. Follow The Mound up to the Royal Mile. Turn right onto the Lawnmarket and look for Lady Stair’s Close on the right. Exit Waverley Station onto Waverley Bridge and turn left. Cross near the roundabout and go up Cockburn Street. At the top of Cockburn Street, turn right onto the Royal Mile and continue on past George IV Bridge and Deacon Brodie’s pub. About 100 metres on from Deacon Brodie’s on the right hand side of the road is Lady Stairs Close. Go down the close and you’ll see the Museum. The Lothian Bus No. 67 goes past Waverley train station on Waverley Bridge, and travels down George IV Bridge. You should get off at a stop near to the point where George IV Bridge crosses the Royal Mile, and then walk up the Mile towards the Castle, looking for Lady Stair's Close on your right hand side. The No. 45 can be picked up on Hanover Street, after which it crosses Princes Street and heads up the Mound to George IV Bridge. There are no parking facilities at the Writers’ Museum. ‘Pay and Display’ on-street parking is available nearby. The main entrance has 1 step and a handrail. Due to the historic nature of the building, there is no lift and no ramp. Unfortunately, due to the nature of the building, the exhibitions are accessible by stairs only. Some parts of the venue have low lighting. We have display information in large print. Information in different languages including: French, Italian, German, Spanish and Japanese. Large print version of all museum text available on request. Due to the number of requests for group visits, please contact us as far in advance of proposed visit as possible. This enables us to determine if we can accommodate group on preferred date(s). The rise of Robert Burns (1759-1796) from ‘ploughman’ to poet and darling of Edinburgh society is the stuff of legend. The Writers’ Museum holds an outstanding collection of personal objects, published works and manuscripts relating to one of Scotland’s best-loved poets. This collection at the Writers’ Museum evokes the adventurous life of one of Scotland’s best-loved writers. It includes portraits and photographs, personal possessions and books, as well as treasures from Stevenson’s travels. 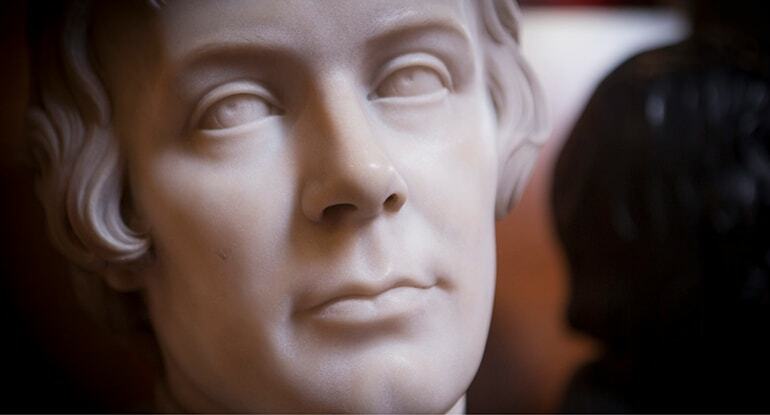 A fascinating collection of items relating to the great Scottish writer and poet Sir Walter Scott (1771-1832), raning from a printing press and chess set to an inkwell and published works. 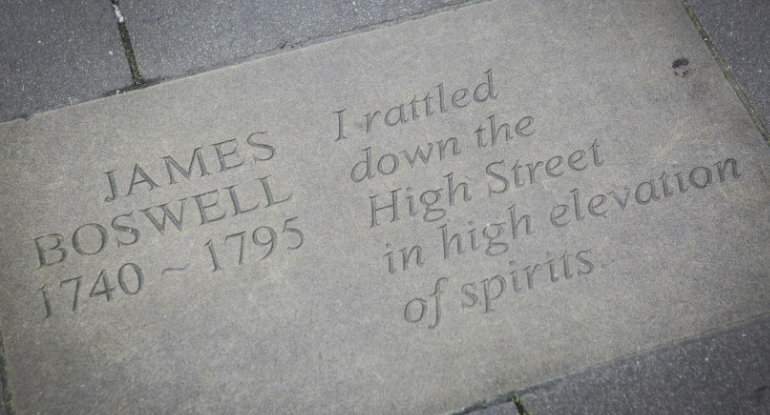 Outside The Writers' Museum you will find Makars' Court: a peaceful public space with beautifully inscribed flagstones which celebrate Scottish writers from the 14th century up to the present day. Makars’ Court is the perfect place to unwind, reflect on the talents of Scotland’s wordsmiths and soak up the atmosphere of this historic quarter of the Royal Mile. Makars’ Court is an evolving national literary monument, with new stones added regularly. Download our comprehensive access guide to find out how you can get to and around the The Writers' Museum. Why not discover more of our fascinating venues? The People's Story gives an unique insight into Edinburgh's working class people from the 18th to the late 20th century.